Could you be exempt from paying thousands in council tax? Figures from the Office for National Statistics show how many of our High Streets are dominated by fast food takeaways. Customers have been left unable to pay bills. KPMG's annual Fraud Barometer report showed a loss of £9 million so far this year. The expected increase could hit some long-distance commuters with a price hike of more than £330. Welsh Government warned of pressures to make taxes less "fair"
An independent report is calling for a 'moderate' increase in tax to pay for the care of the elderly. The new law will address longstanding and specific health concerns around the effects of excess alcohol consumption. 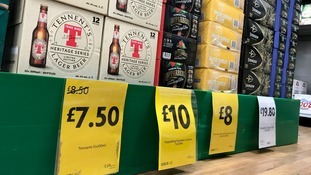 The Welsh Government says a minimum price per unit would help tackle alcohol abuse and save the NHS money.